How about living in a yurt? A modern version of this ancient structure (fragments found have been dated at 5000 BC) could be used as a home on your piece of rural land in Northern Arizona. 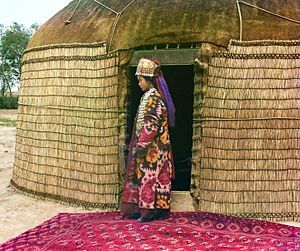 Yurts use compression and tension to form a freestanding, clear open structure. At the top of the yurt, the hub or compression ring is under pressure from the rafters, which radiate out from it. Could You Put a Yurt on Your Rural Northern Arizona Land? Why not, there have been several for sale in our area and I’ve seen used ones on Craigs List. The rafters span out and down from the ring at a thirty-degree angle, and hook onto the main cable. The main cable is a continuous loop, preset to the exact circumference of the yurt. It is supported by the lattice wall and is enclosed by the fabric. Could You Put a Yurt on Your Rural Northern Arizona Land? Kingman Area Rural Land Yes, you could! Posts in this series include living in Teepees, Tents, and Strawbale homes on rural land.